S wind around 23 kt, with gusts as high as 30 kt. Showers and thunderstorms. Seas 1 ft or less. S wind 15 to 20 kt becoming WSW after midnight. 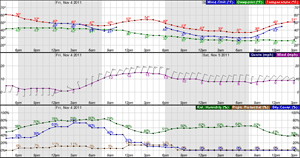 Winds could gust as high as 27 kt. Showers and thunderstorms likely before 10pm, then a slight chance of showers between 10pm and midnight. Seas 1 ft or less. SW wind 14 to 18 kt, with gusts as high as 25 kt. Sunny. Seas 1 ft or less. WSW wind 9 to 13 kt. Partly cloudy. Seas 1 ft or less. W wind 8 to 10 kt. Sunny. Seas 1 ft or less. W wind around 6 kt becoming variable and less than 5 kt after midnight. Clear. Seas 1 ft or less. Variable winds less than 5 kt becoming SE around 6 kt in the afternoon. Sunny. Seas 1 ft or less. Mariners are reminded that winds and waves higher in and near tstms. Unless otherwise noted, waves 1 foot or less. Charleston Harbor water temperature 71 degrees.